Deepen your sense of the past at sights like Clock Tower and Cathedral of Our Lady of Immaculate Conception. Get in touch with nature at Morne Blanc and Anse Takamaka Beach. 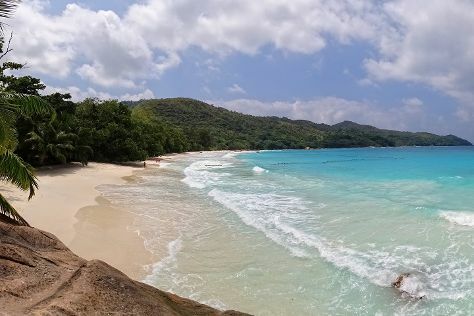 Change things up with these side-trips from Mahe Island: Beau Vallon Beach (in Beau Vallon) and Petite Anse (in Baie Lazare). Next up on the itinerary: enjoy the sand and surf at Anse Intendance, don't miss a visit to Victoria Market, stroll through Sunset Beach, and trek along Copolia Trail. To find where to stay, more things to do, reviews, and other tourist information, use the Mahe Island holiday planner. Toronto, Canada to Mahe Island is an approximately 26-hour flight. You'll lose 9 hours traveling from Toronto to Mahe Island due to the time zone difference. Expect warmer temperatures when traveling from Toronto in February; daily highs in Mahe Island reach 35°C and lows reach 30°C. 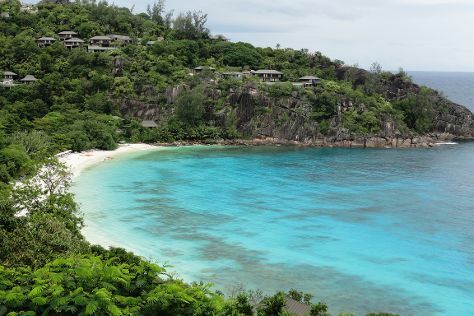 Finish up your sightseeing early on the 23rd (Thu) so you can travel to Praslin Island. Get outdoors at Sisters Islands Private and Vallee de Mai Nature Reserve. We've included these beaches for you: Petite Anse Kerlan and Cote d’Or Beach. The adventure continues: stroll through Anse Georgette, view the masterpieces at Rita's Art Sudio & Gallery, kick back and relax at Anse Marie-Louise Beach, and trek along Le Glacis Noir. To see traveler tips, maps, reviews, and other tourist information, use the Praslin Island trip itinerary builder. Traveling by combination of car and flight from Mahe Island to Praslin Island takes an hour. Alternatively, you can ride a ferry. In February, daytime highs in Praslin Island are 35°C, while nighttime lows are 30°C. Finish your sightseeing early on the 27th (Mon) to allow enough time to ride a ferry to La Digue Island. Get in touch with nature at Anse Patates Beach and Union Beach. You'll get in some beach time at Grand Anse and Spiagge di Anse Marron. There's lots more to do: enjoy the sand and surf at Anse Source D'Argent, tour the pleasant surroundings at Anse Pierrot Beach, and appreciate the history behind Plantation House National Monument. 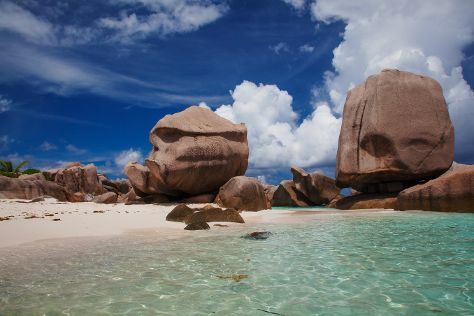 To find more things to do, reviews, where to stay, and other tourist information, read La Digue Island itinerary builder. La Digue Island is very close to Praslin Island. In February, plan for daily highs up to 35°C, and evening lows to 30°C. Finish your sightseeing early on the 3rd (Fri) to allow enough time to travel back home.